Maintaining normal testosterone levels is crucial to good health for men and women. There are no set parameters for normal testosterone levels by age – every lab has its own reference chart. This may seem confusing, but blood test results are not the only predicting factor for Low T. Even if testosterone levels are very low, if no symptoms are affecting one’s life, then no treatment is necessary. In most cases, the body will adjust to changing hormone levels. A person may also find that symptoms of Low T occur even when testosterone levels fall within normal limitations. In this case, testosterone replacement therapy can be beneficial. It is also necessary to determine if low testosterone levels are due to aging or other factors, which the blood tests will show. We will send you to a local lab to have a sample of blood collected for analysis. In the normal total testosterone levels above, we have taken the lowest end of the scale from among the many labs and medical centers that provide their ranges and extended that to the high end of the numbers from these charts. What you see in the average total testosterone column is what to expect at those ages, although those numbers are far from ideal, as you will see in the next section. Women’s total testosterone levels can go as low as 8 ng/dL and as high as 95 ng/dL to be considered normal. Since some of the charts show the low end to be 15 or 30 ng/dL, you can see the discrepancy, and know why doctors also look at symptoms when determining Low T.
For free testosterone levels in women under 50 years of age, the level is over 1.5 pg/mL, and for those over 50, it is 1.0 pg/mL. Judging from the chart above, a 45-year-old man would be marked deficient if his total testosterone level went below 201 ng/dL. If you compare it to the average at that age, it is well below the 500 to 550 ng/dL. It is not surprising then that someone with testosterone levels so low would be suffering from a variety of symptoms of low testosterone levels. But what about the man who has normal testosterone levels of 350 ng/dL at the same age. The chart says he should be fine, right? That is why doctors look to raise average testosterone levels up to 550 ng/dL when using testosterone replacement therapy. That is the magic number that seems to bring the best results. 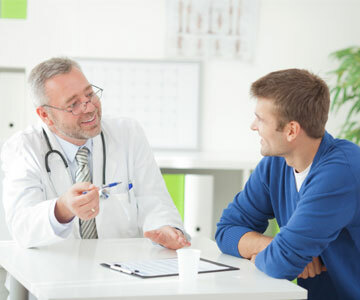 If you are wondering how to raise testosterone levels with testosterone replacement therapy, you have come to the right place. Greenberg Health helps men and women throughout the US bring balance back to their hormone levels. Of course, if you are hovering just below the ideal range for your age, and only just starting to notice some of the symptoms of Low T, you may want to try some dietary and lifestyle changes to increase your testosterone levels naturally. You can use vitamins and herbs to help improve testosterone production. If, however, you know that reaching high testosterone levels through hormone replacement is right for you, or you have questions you would like answered, then give us a call here at Greenberg Health. We offer free consultations, local diagnostic testing, and affordable treatment options for men and women throughout the US.